As children we sang Jelly on a Plate when we were skipping (or jumping rope.) The two children turning the rope sang the nursery rhyme. The child skipping performed the song’s actions, i.e. wiggling and wobbling like jelly on a plate, blowing out candles, flipping from back to front, gobbling up sweets and tipping the ground as if picking up money. If there was a group of children playing then the skipping privilege would pass from child to child; each would only skip for one verse. Then all the children in the group would jump in to skip together at the end. The Speks recreate this idea of a group of children skipping by having a different singer sing each verse. We also introduce the sounds of four melody instruments individually: timber flute, fiddle, banjo and accordion. An instrument plays the melody of the song’s verse on its own after each singer. To represent the group of children skipping in unison, all instruments play together for the finale. Throughout the song, the rhythm of the guitar is the same as the jumping rhythm of the skipper. 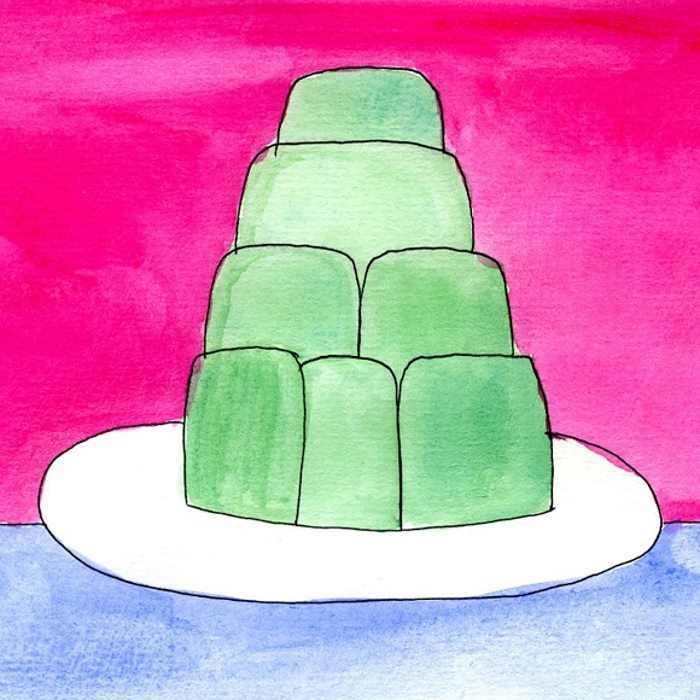 Click on the play arrow above to listen to our version of Jelly on a Plate set to Irish music for kids. Go to our Skippin' Song page on Bandcamp where you can share our nursery rhyme with your friends and/or get it as a free MP3 download. Click on the arrow below to watch our youtube video clip of "Jelly on a Plate"
Physical Education: Bring your class skipping. All that is required is a rope. It’s fun and great exercise! Encourage your pupils to compose other verses and help them with the actions. Art: Illustrate subject items in each verse, e.g. jelly on a plate, sausages in a pan, etc. If your pupils have composed other verses then get them to also illustrate the subject items.